When we no longer have confidence in collective action, why would we even bother to ask something of our anemic government? By not taking firm steps to deal with the Syrian civil war and refugee crisis from the beginning, we have allowed a ticking time bomb of humanity to destabilize the Middle East and give comfort to vocal xenophobic factions in Europe. On the campaign trail this week, public concern at the door was focused on the tragic plight of millions of Syrian refugees. Few Canadians I met at the doorstep took seriously the claims by Stephen Harper that the government had acted appropriately. Whatever one's view of our military action bombing ISIL targets in and outside Syria, all agreed that our government had shamefully abdicated Canada's moral responsibility for helping Syrian refugees. 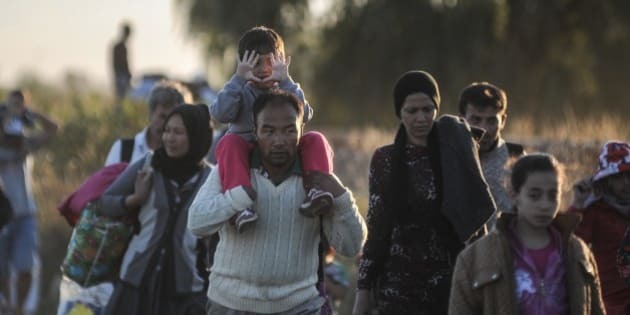 There was equal agreement that the refugee crisis had demanded serious federal action long before ISIL entered the picture, arising as it did from the actions of Syria's cruel and tyrannical dictator Bashar al-Assad. Indeed the crisis was entirely foreseeable as early as 2012. Why then was appropriate action not taken? Among others things, by endlessly reciting the self-serving mantra that less government means better government, the Harper Conservatives have established a new normal of uninspiring national leadership and growing distrust for collective action. Through spin and misinformation, the Harper government has driven down expectations of what a modern 21st century government can accomplish, and has made us all unwitting collaborators in the collapse of our ability to discharge our responsibilities to the broader global community. When we no longer have confidence in collective action, why would we even bother to ask something of our anemic government? Contrary to the claims of the Harper Conservatives, this has made us palpably less safe and less strong. By not taking firm steps to deal with the Syrian civil war and refugee crisis from the beginning, we have allowed a ticking time bomb of humanity to destabilize the Middle East and give comfort to vocal xenophobic factions in Europe. Indeed in October 2012, even as the Syrian situation was worsening, resulting in a rapidly growing backlog of applications for private sponsorships of Syrian refugees, the Harper government actually made regulatory changes that substantially reduced new applications. The changes meant that Canadian relatives of Syrian refugees -- groups of five or more Canadians or G5s -- could only sponsor refugees who had passed the almost-impossible step of being pre-cleared in a timely manner by the UN High Commission for Refugees (UNHCR). Since 2011, the UNHCR has been only able to process a fraction of the refugees to formally determine that they are Geneva Convention refugees. What Canada should have done is ramp up our overseas frontline capacities in 2012 commensurate with the growing need to provide refugee protection outside the growing conflict zone. Indeed we must have an effective and efficient frontline immigration and refugee organization outside Canada at all times. We need more, not fewer, immigration-processing centres, and more, not fewer, competent Canadian frontline staff. Furthermore, this staff must have all the resources they need to complete security and identity checks, and to sort out issues of foreign credentials and work experience in an expeditious manner. Our anemic processing of refugees from Syria is truly shocking. With the number of Syrian refugees now exceeding four million and climbing, Canada has accepted a grand total of 2,374 Syrian refugees from 2013 to date; of which 1,752 came by way of private sponsorships and 622 as the result of government assistance. This is pathetic compared to the kind of effort Canada has made so many times in the past, such as when we accepted over 60,000 Vietnamese boat people. It pales by comparison with the thousands accepted to date by Germany and Sweden, and completely fails to take into account the hundreds of thousands of others still displaced across Lebanon, Jordan, Egypt and Turkey. It should be noted that ramping up our immigration frontline capacities is in fact long overdue and dates back to Liberal governments and much as Conservative. As a member of the Immigration and Refugee Board for a few years before and after 9/11, I was deeply disturbed at the lack of investment in our capacity to determine expeditiously who were the self-selected refugees arriving in Canada from around the world. I must immediately emphasize that the vast majority of refugees appearing before me had well-founded asylum claims and were eventually able to provide satisfactory evidence of their identity and fear of persecution. But on at least one occasion, even before the Maher Arar tragedy became public, I was shocked to discover that our under-resourced staff in a Middle East mission had explicitly contacted Syrian authorities to corroborate a particular element in a claim for asylum, a step that in and of itself established the claimant's well-founded fear of persecution. Let there be no doubt, even in the early 2000s, the cruel governance of Bashar al-Assad should have been clear to all and it was extraordinarily shameful that our own frontlines were not sufficiently informed and instructed accordingly. All of this demonstrates only too clearly the tragic consequences of Canadians coming to expect less and less of our government, and of each other, just at the time when we should be demanding more. We have less public confidence than ever in our politicians to provide the steady, trustworthy and visionary leadership to tackle the challenges ahead. This means less ability to undertake much-needed, long-term collective action. Instead, we are governed more and more by short-term incentives and fears. I am confident that this situation can be reversed. Canadians want to believe a different way is possible. We need straight talk and clear goals. We need governments capable of listening, working collaboratively with other parties, and then taking reasonable, principled actions in support of the country as a whole. This is the way to win back the trust and respect of Canadians who have come to believe that politicians all too often serve themselves, rather than the people. Canada's immigration and refugee protection system is a critical component of our social and economic fabric. It is a reflection of our values. Immigrants have always been crucial to building Canada and enriching both our economy and society. By about 2040, 100 per cent of our population growth will come through immigration (about 60 per cent already does). It is an exciting time to be Canadian -- we have enormous potential. Canadians from all corners of the globe are building one of history's most fascinating, diverse and cosmopolitan nations.